Joshua Tree National Park is a gem of a desert landscape in Southern California. Despite its beauty, the park is one that is somewhat ignored by many photographers in comparison to areas such as Death Valley National Park, which is located only a few hours away. Joshua Tree does not have many of the iconic views and grand vistas that come with many of the parks of the American West. So, if you are looking for pre-made tripod holes to shoot from, Joshua Tree may not be for you. However, it has become one of my favorite places to visit because of its unique rock formations and desert vegetation. For those willing to take some time to explore, Joshua Tree can allow you to capture plenty of unique photos that cannot be found at many of the other parks in the western United States. My #1 Tip for Photographing Joshua Tree! If you haven't already downloaded the Really Good Photo Spots app… what rock have you been hiding under? LOL. 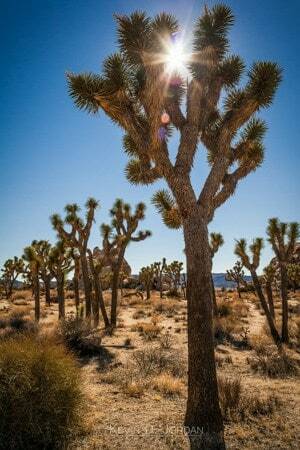 It's a really cool app with thousands of photo spots all around the world, and quite a lot in Joshua Tree. The app is free and available for iPhone and iPad. It's really nice to be able to just pop open the app while on your trip and click “Spots near me” and BOOM! You have great spots to go shoot. It's pretty cool. Download the Really Good Photo Spots app from the Apple App Store. 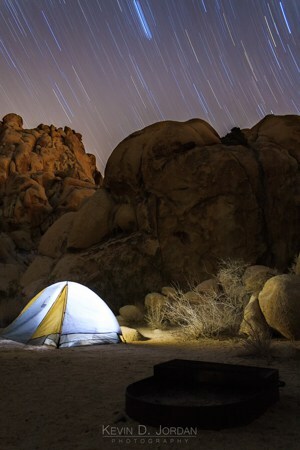 In terms of lodging, the full Joshua Tree experience means camping in the park. The campgrounds in Joshua Tree are some of the most unique and picturesque I have seen, with many of the tent sites nestled in the monzogranite rock formations and yucca plants. As of this writing (February 2017) only two campgrounds, Black Rock and Indian Cove, accept advanced reservations, while the remaining sites are first come, first serve. However, I did hear rumors while in the park that all campgrounds will be moving to reservation-only in the future. If bathrooms and flush toilets are a necessity for you, you will want Black Rock to be your campground. However, for those who can stand the sometimes pungent odors of a pit toilet, Indian Cove offers, in my opinion, a more unique and picturesque place to stay, with tent sites that provide a bit more privacy due to being nestled among the rock formations, as well as plenty of photo opportunities without even leaving the campsite. For those who are willing to visit the park without planned lodging, campgrounds such as Jumbo Rocks, Hidden Valley, White Tank, and Sheep Pass allow you to stay close to some of the best possible photo locations in the park. If camping is not your thing, there are many hotel and motel options along Highway 62 along the northern boundary of the park. Keep in mind that many of the best photo opportunities are located in the western, northern, and central portions of the park, so lodging with easy access to these areas will help you minimize drive time to get to the spots you may want to shoot. There is no public transportation in Joshua Tree, so having a car is by far the easiest way to see the park. For those in better physical shape, a bike could be a good option in the cooler months due the relatively little rain that falls in the park. 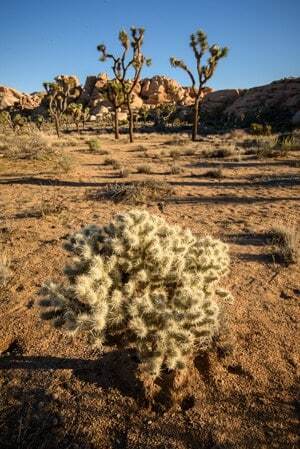 As with any national park, Joshua Tree has safety concerns to take into consideration during your time there. The most obvious one is the heat, which can cause dehydration very quickly. Further, the few water sources in the park are preserved for wildlife, so plan on bringing ample water supplies with you when you enter the park. Also keep in mind that many of the vegetation in the desert will not hesitate to impale you if you walk too close, so always be aware of your surroundings, especially when you have your eye up to the viewfinder. 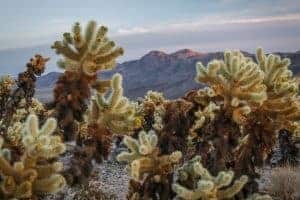 Now that all that is out of the way, the following gives a rundown of some can’t miss photo opportunities in Joshua Tree National Park. 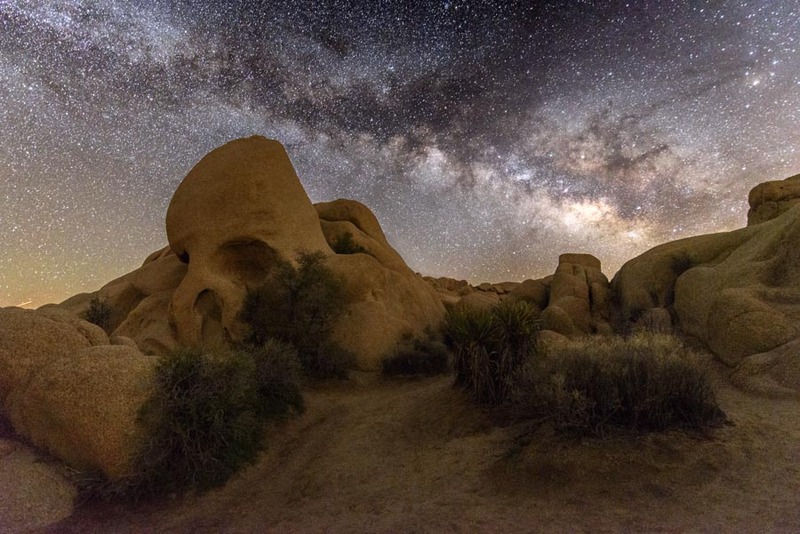 Skull Rock is one of the most recognizable and easily accessible locations in Joshua Tree, situated just a few dozen yards from Park Boulevard. The rock formation is unique and the mood it provides can change drastically with the lighting conditions. Given that there aren’t many places to set up far back from the rock, a wide or ultra-wide angle lens will allow you to get the best angles. Skull Rock is also situated on a 1.7-mile nature trail that begins at nearby Jumbo Rocks Campground. The best view of Skull Rock will have you facing in a south, southeast, or southwesterly direction, meaning that the sun will be in your face during most of the daylight hours. For best lighting, Skull Rock deserves a cloudy day, early morning, or late day visits. Skull Rock is also a great nighttime location given how easily accessible it is and the dark skies much of Joshua Tree provides. Skull Rock is situated right off Park Boulevard about a 30-minute drive from Indian Cove and about 50 minutes from Black Rock Campground. Parking on the side of the road is available. Skull Rock is visible from the road and is a quick walk from the southern side of Park Boulevard. The Cholla Cactus Garden is another obvious photo spot in the park due to its high concentration of cholla cacti. Chollas are found in various other places throughout Joshua Tree; however, the garden gives you the most bang for your buck if you want to cram a lot of them into your frame at once. A wide or ultra-wide lens is great to show the chollas and nearby hills, but a telephoto lens could also bring some unique detail shots of the cacti and their spines. Be EXTREMELY aware of your surroundings when photographing near chollas. Their spines attach very easily to skin, clothing, and shoes, and are difficult and painful to extract. Chollas also drop balls of spines, so be aware of where you step and wear durable closed-toed shoes. If you do happen to get stuck with spines, don’t try to removed anything with your hands, as it will certainly result in getting impaled with spines there as well. Chollas can be shot at any time, but they undoubtedly look the best during golden hour. The high density of thin spines on chollas make them look like they are glowing when the sun hits them, so aiming to get a shot when the sun is close to the horizon can give the plants a great look. This makes the cholla garden a great spot for sunset since the nearby hills are located to the west. The Cholla Cactus Garden is located along Pinto Basin Road in the central part of Joshua Tree. It is located about a 40-minute drive from Indian Cove Campground and just over an hour from Black Rock Campground. The garden is situated just off the road and has ample parking to accommodate visitors. There are many attractions to the Barker Dam area that might entice photographers. The dam is one of the only places in the park where you can get a glimpse of water (sometimes), and is a possible hangout spot for wildlife such as bighorn sheep. More reliably, the Barker Dam area is home to Native American petroglyphs, ample fields of Joshua Trees and other vegetation, and boulder formations that provide unique backdrops for landscape photos. Bring all of your lenses for Barker Dam, as anything from an ultra-wide lens to a telephoto can be used to photograph the many possibilities there. With how many different subjects can be shot in Barker Dam, there is no bad time to visit photography-wise. However, Barker Dam is a popular spot among all types of visitors, so in order to get a parking spot you may want to avoid midday hours. Barker Dam is a 360-degree location, meaning that you can find something to shoot in all directions. Barker Dam is located in the northwestern portion of Joshua Tree and takes about 40 minutes to drive to from both Indian Cove and Black Rock Campgrounds. If you find yourself staying in first come, first serve campgrounds such as Hidden Valley, however, Barker Damn is only a few miles away. As mentioned above, the Barker Dam parking lot can fill up at busy times, so keep this in mind if you plan to visit during the midday hours during seasons with high visitation. Arch Rock is a natural granite archway located along a nature trail in the White Tank Campground. It is also one of those few iconic shots in Joshua Tree along with Skull Rock and the Cholla Cactus Garden (and, you know, Joshua Trees…). You can get right next to, on, or in the archway, so a wide or ultra-wide lens will be ideal for getting the arch and the surrounding sky and landscape. Arch Rock is a popular spot with limited parking, so avoiding busy times at the park is ideal. The most popular view of the archway has you facing to the southeast; however, you can easily climb around to different vantage points, making the archway photogenic from many angles. Therefore, both sunrise and sunset are a possibility, as well as springtime nights when the Milky Way is located to the southeast in the early morning sky. 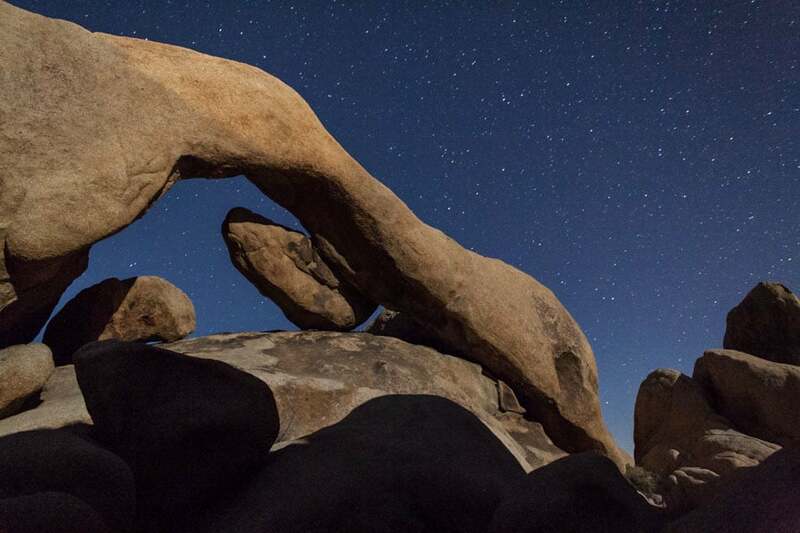 Since Arch Rock is located in White Tank Campground, take care not to disturb campers, especially if you go at night. Arch Rock is located off of Pinto Basin Road about a 30-minute drive from Indian Cove Campground and 50 minutes from Black Rock. For those staying in White Tank Campground, a short walk down the nature trail beginning at campsite #9 will get you there. There is limited parking at the trailhead, so take care not to parking in spots reserved for nearby campers. If you are travelling from far away, Indian Cove, at the time of this writing, is one of only two campgrounds in Joshua Tree that can be booked in advance. As a result, even just for guaranteeing that you have a place to camp makes going to Indian Cove worth it. However, given the unique rock formations and fields of cacti and vegetation, as well as the dark skies, it is also a very picturesque photo location. Indian Cove is also the location of one end of the popular Boy Scout Trail, making it an ideal spot to access this long, popular hiking route which ends inside the park along Park Boulevard. Bring all of your lenses to Indian Cove, as it provides opportunities to use everything from an ultra-wide lens to a telephoto. If you are camping there, you have the benefit of shooting in Indian Cove whenever you would like. Harsh midday light notwithstanding, there isn’t a bad time to shoot in Indian Cove, as there are photo possibilities in every direction. However, golden hour and twilight provide great light that play off the rock formation and cacti, so traditional ideal time for landscape photography certainly apply. Keep in mind that if you are not camping in Indian Cove you will need to make friends with someone who has a campsite in order to park. Indian Cove is conveniently located a zero-minute drive from Indian Cove Campground and about 25 minutes from Black Rock Campground. For those looking to access the Boy Scout Trail, trail head parking is located along the access road about one mile outside the entrance to the campground. Keys View is one of the only easily accessible elevated lookouts in Joshua Tree, and its west-facing view makes it ideal for sunset. The viewpoint is situated at the top of Keys View Road, and, although it has a paved observation deck, there are plenty of places to walk around, find a compelling foreground, and enjoy the view without being surrounding by other people. Looking west from the viewpoint gives you a view of the valley below that is home to the San Andreas fault, Palm Springs, and the San Jacinto Mountains to the west. A variety of lenses will work here, including ultra-wide for the sweeping landscape shot and a telephoto for more intimate views of the distant mountains. Given that it faces west, Keys View is an ideal sunset location. During a cloudless sky, however, looking west before sunrise can provide some great lighting and a view of the Belt of Venus. It is worth arriving a bit early during busy visitation season to get a parking spot for sunset. Keys View is about a 45-minute drive from both Black Rock and Indian Cove Campgrounds. From the northwestern entrance to the park, travel down Park Boulevard and take a right on Keys View Road at Cap Rock. Yes, I get it, Joshua trees aren’t really a location. 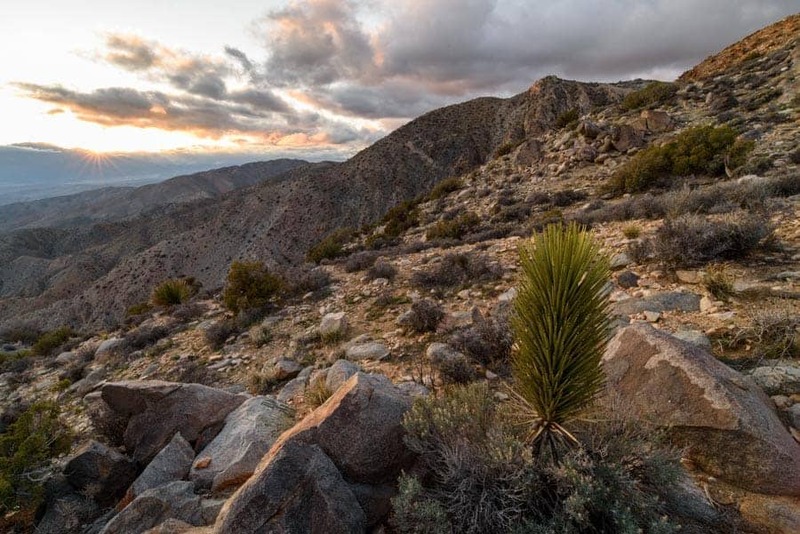 However, since this park is one that deserves some exploring of the finer details of the landscape as opposed to only grand vistas, the Joshua tree cannot be ignored. It’s a rugged, unique tree that looks like something out of a Dr. Seuss book, and they are a joy to photograph. 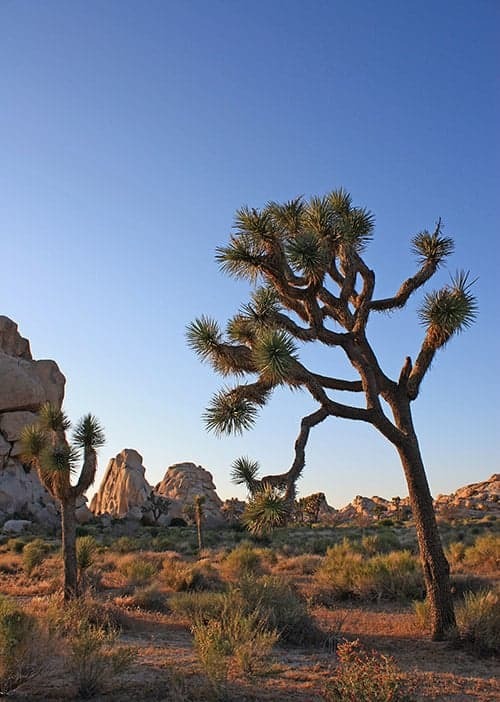 Joshua trees are found in highest concentration in the northwestern portion of the park. They bloom with white clusters of flowers in springtime, and are well worth your attention if you happen to be in the park that is named after them. Yes, I still get it, rock climbers are also not a photo location. 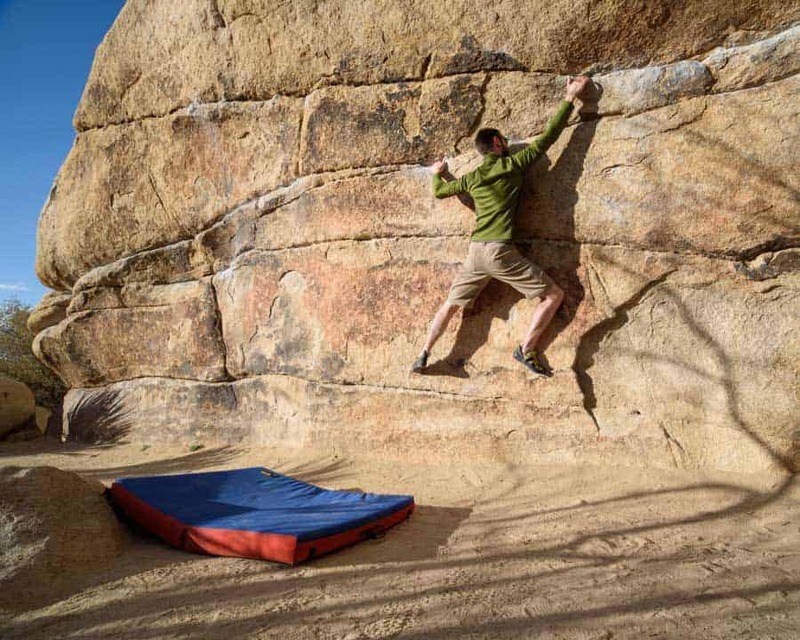 However, as popular at the park is for everyday tourists, Joshua Tree National Park is a top-notch destination for rock climbers, especially boulderers. (Bouldering is climbing done low to the ground with no ropes and only small foam pads for landing protection.) Climbers can be found throughout much of the park; however, popular locations such as Barker Dam, Hidden Valley, and Intersection Rock have high concentrations. Photographing climbers are a great way to add human interest to a landscape shot or switch into adventure photography mode. Climbers will be out in all daylight hours, but will most likely avoid the hottest hours of the day in summertime. There are a few other locations throughout the park that deserve exploration. If you make it through the spots above, take a look at the following list as a way to expand your views of the park.